First, the wonderfully snappy blog, Agents of Field, where Agent Ade and Agent Sophie write about their allotment (community garden in the U.S.), vegetables, cooking, and their love of gardening in general. In a recent post, Agent Sohpie extolled the virtues of her veggie spiralizer, which she bought for just over ten pounds at a grocery store. She included a very tasty soup recipe, which featured spiralized zucchini—or courgettes, as they call them across the pond. For quite a while, I had been thinking about buying a veggie spiralizer, and Agent Sophie gave me just the nudge I needed. This brings my to my second thing to be grateful for—my very own veggie spiralizer. We ordered one from Amazon, and it arrived a few days ago. It’s handheld, cost $13, and works like a charm. Clif and I have been spiralizing like crazy, and last night I made a tasty little salad using zucchini spirals, lemon juice, olive oil, salt, and pepper. Pretty tasty! I really like the idea of using spiralized zucchini or yellow squash in a soup, and as soon as the weather cools down a bit, I’ll use them in soup, too. Third, and on a completely different note, the Maine Author Shelf at my town’s public library. A month or so ago, Richard Fortin, the director of our library, put together a Maine Author Shelf along the railing in the lobby. Anyone who goes into the main section of the library passes it, and I’ve been told the books have attracted a lot of interest. My own novel, Maya and the Book of Everything, has been on that shelf, and I happy to report it has been borrowed on a regular basis. 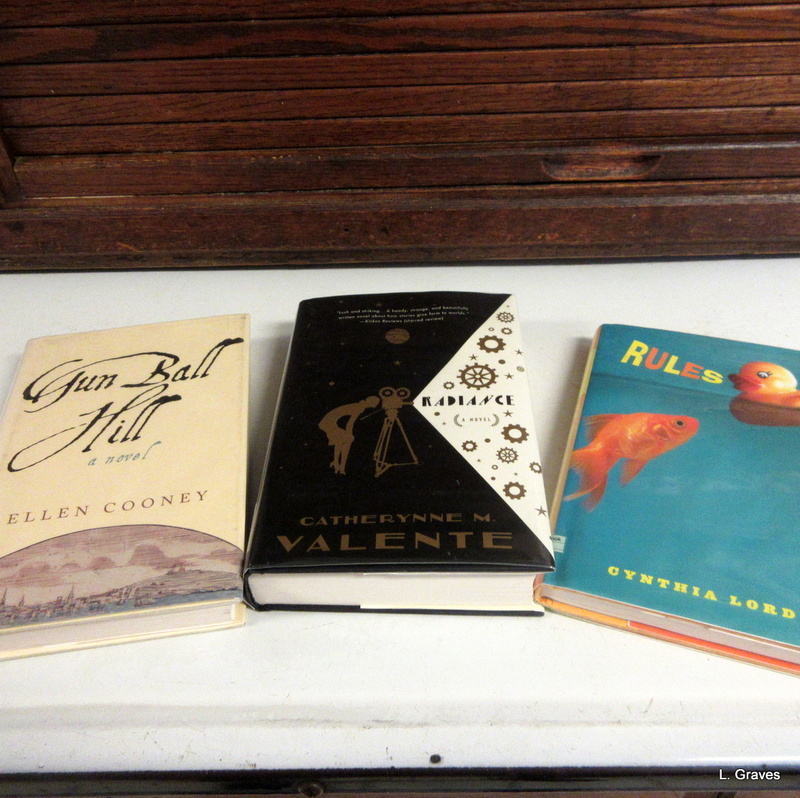 But best of all, I have been introduced to books I was unaware of, and here is a picture of three of the most recent books I found on that shelf. A hint to my blogging friends: Perhaps you could suggest that your library put up a display of books written by local authors. Not only would it give them a boost, but it might also introduce you to books you have not heard of. You will love it! And, yes, so nice when libraries (and bookshops) prominently feature local authors. ‘Twas my pleasure! Oh, how I love that spiralizer. Have you published a book? If so, what’s the title, genre, etc.? Not a book (yet!) but a handful of short stories in anthologies and lit mags. Nice! Are any of them in online magazines? No, all in print rather than online – I’ll let you know if that changes! I had never heard of a vegetable spiralizer. What great ideas. I hope your book is also at the Maine State Library. I think they try to keep books by Maine authors there so they are available to everyone in Maine. Thanks for the advice, Beth. I’ll get in touch with the Maine State Library. Good ideas! I’d never heard of a ‘spiralizer’ before! Congratulations on acquiring a spiralizer. And it’s good to hear that your book is in demand at the local library. Oh, how we love that spiralizer. So nice to know my book is being read. 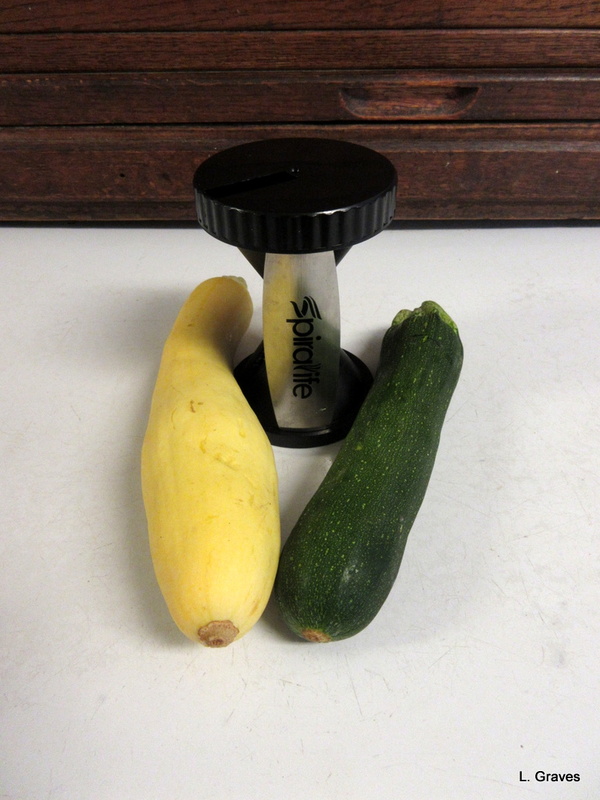 If you lived closer, knowing now that you have a handy dandy spiralizer, I would be leaving you all the many, many, many extra zucchinis growing in the garden for you to spiral into a plethora of summer squash recipes. I do realize in actuality that you only live a mere hour away and you could very well make the trip over, if your trunk was empty, and fill up. Open invitation. 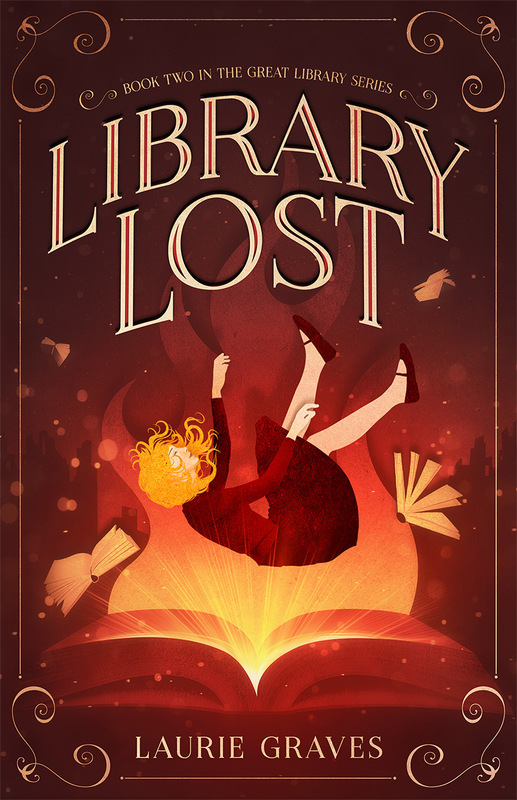 Glad to hear that your book is being taken off the shelf and read….perhaps the reader is stretched out beneath a big shade tree, cold glass of lemonade near by, book in hand and lost in its tale. Thanks so much for the offer of zucchinis and the kind words about my book. Who knows? Perhaps we’ll make the trek sometime soon. Those spiralizers are a wonder, they are! I can’t wait to use spiralized zukes in soup. Yummy and healthy! I have been meaning to get a spiralizer for ages! Perhaps I will actually do something about it now! I bet you will love it. I’m using mine tonight. Libraries are fascinating places. I like the idea of local one’s supporting local writers.